Rebounder Knee Pain: Can Rebounding Hurt Your Knees? » Rebounder Knee Pain: Can Rebounding Hurt Your Knees? The concern whether rebounding can hurt your knees is probably a strong reason why you haven’t started your rebounding routine yet. So is it true? Does rebounding hurt your knees? The answer is, yes, it does. In this article, we will dissect this concern and show you both the harms and the benefits caused to your knees by rebounding. Does Jumping on a Trampoline Hurt Your Knees? Can You Use a Rebounder With Bad Knees? 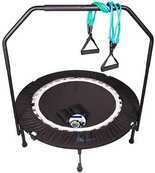 Is a Rebounder Good for Knees? Time is one of the most expensive things in the world. With work, family and other commitments, taking time off for the gym sometimes seems impossible. Rebounding, on the contrary, is convenient, less time-consuming and very effective. It has been scientifically proven that rebounding is more effective than even jogging. It will strengthen your cardiovascular system, immune system, hormonal system and contribute to improving intimacy and mental health as well. It’s a great way to tone your muscles, increase your flexibility and improve your posture. The list goes on. The bottom line is, rebounding is a great way to get healthy. Due to these reasons, it is increasingly becoming everyone’s favorite workout. By everyone, we mean adults and kids too. Nonetheless, just like everything else, even rebounding does have certain cons. The most prominent among them is the rebounder impact on knees. Yes, if you are not cautious enough, you could give yourself a rebounder knee injury. The most common kind of a rebounder knee injury is a hyperextended knee. A hyperextended knee is when the knee is twisted in an unusual way, which causes the ligament to tear. This can be extremely painful. What’s worse is it could last for days. The symptoms of a hyperextended knee are pain and swelling in the knee area, pain when walking and a temporary inability to run or jump. If you were rebounding when this happened, you might not be able to continue rebounding. Just as with any other joint in the body, a hyperextended knee will require immediate medical attention. This is to prevent any long-term problems as a result of negligence. With the right kind of treatment, your knee will be as good as new within a week. Also, if you’ve ever seen a trampoline, then you know its edges are made of metal. Another common cause of a rebounder knee injury is falling on the metal edges while jumping. However, this problem exists in all forms of physical activity. For instance, if you’re not attentive enough while walking on the road, you could step on a sharp object and hurt yourself. Scratching the knee by falling on the edge is quite common among kids. However, nowadays, manufacturers make mini trampolines with flexible netting. This provides extra protection and prevents any rebounder knee injury of this nature. Injuring your knee while rebounding and rebounding with a bad knee are two different things. If the existing knee injury is severe, then of course, rebounding may not be a practical solution. However, for someone who has general knee problems, most physical activities are not recommended. So they usually avoid extreme games, squats, and push-ups. Rebounding on a mini trampoline isn’t among the activities that they should avoid, though. In fact, rebounding on a mini trampoline could strengthen their knees. This is because rebounding is considered to be a low-impact exercise. Unlike high-impact exercises such as soccer and basketball, the rebounder impact on knees is less intense. Still, if you are someone with bad knees, make sure you don’t go overboard with your trampoline exercises. Also, make sure you only use a springless mini trampoline for your rebounding workout. We will discuss the choice of trampolines in more detail shortly. From what we shared above, we’re sure you’ve gathered enough to conclude that using a rebounder is indeed good for the knees. 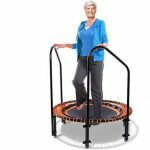 What’s interesting and equally mind-blowing is that the rebounder can even help people who suffer from arthritis. Arthritis can cause severe knee pain and swelling, so exercises such as running or even walking could be too strenuous. Rebounding, on the other hand, is a milder form of exercise as it only includes jumping on a mini trampoline. It will give people who suffer from arthritis enough movement to strengthen their knees. 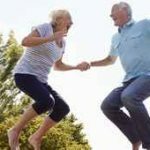 If you are someone who suffers from arthritis, we (and many other experts) recommend that you start a rebounding workout. In the first few days, you may not be able to rebound for longer than 2-3 minutes. You might even find it difficult to get onto the trampoline in the first place. But don’t let these obstacles stop you from working out. Get help from someone and start rebounding. Before you know it, you’ll be able to jump for ten minutes straight. You’ll also feel a significant difference in your knee area afterward. Furthermore, rebounding provides several other benefits, which we stated at the beginning of this article. When we combine all of those benefits, we realize that rebounding can actually protect knees from any possible harm in the future. It strengthens the muscles and increases bone density. It is for this reason that NASA makes their astronauts rebound when they return from outer space. Below, we will share with you some simple rebounding workouts. In the beginning, you might struggle to get them right. But once you start noticing the positive rebounder impact on knees, you’ll never want to give up this routine. Remember we told you we would discuss the choice of trampolines in more detail? Here is where we will do that. When you go to purchase a trampoline, you might be given two choices — one with springs and one without. The trampoline with springs is not the best choice for someone with bad knees. The reason is that the spring trampoline doesn’t absorb the impact of the bounce as much as the springless one does. Someone with bad knees requires an easy workout that won’t strain their knees too much. With a spring trampoline, you won’t get this result. 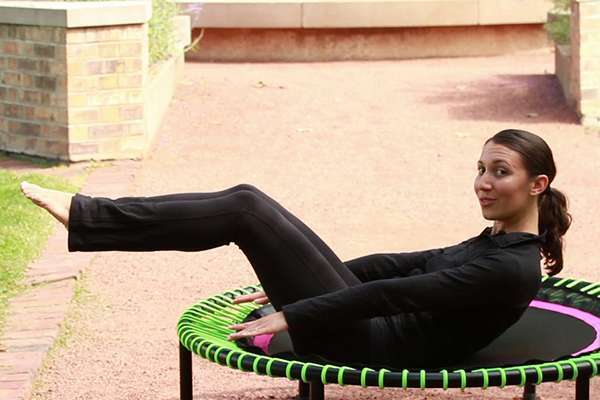 A springless trampoline will make the bouncing easier and more flexible. So you won’t feel like you’re chained to the trampoline. This is what will benefit your knees eventually. Now you know how the rebounder can affect the knees both positively and negatively. It doesn’t take much to suffer from a hyperextended knee. So, we advise you to start your rebounding routine slowly. Since it’s an easy exercise, many people try to rebound for 20 minutes from day 1. This is very bad for your limbs and will give you cramps and sore muscles (and a hyperextended knee). In contrast, if you take it slow, your muscles will be more prepared for longer workouts. Finally, we repeat this quite often and cannot emphasize it enough — it is imperative that you consult a physician before you start rebounding. Only after your physician approves of this form of workout should you proceed with it. Trust us — you’d rather get professional advice than pay a lifelong price because of negligence. We’re quite certain this article has cleared the air about the harm rebounding can cause to your knees. You might have plenty of friends with the same concern, so share this article around and let more people benefit from it. Also, if you have anything to share or add to the content, leave your comments below. We’re always happy to hear from you.